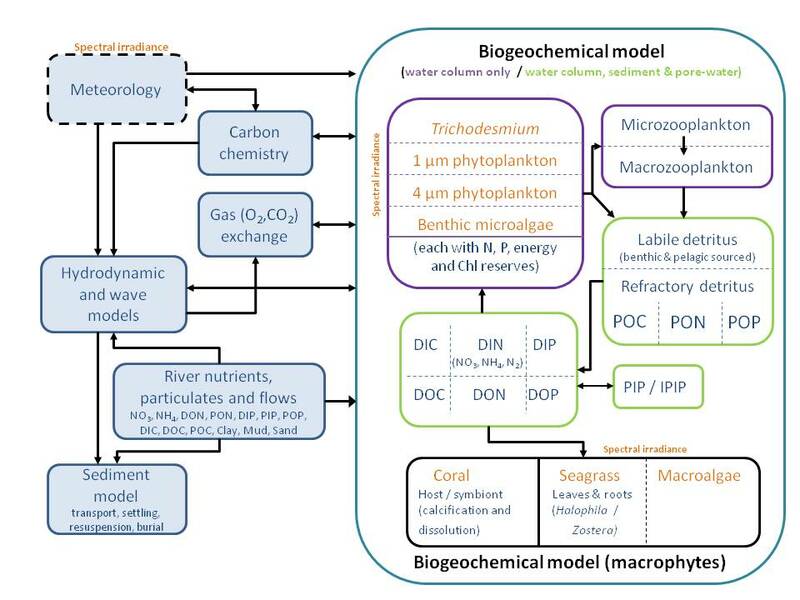 The ecological processes represented in the biogeochemical model include the photosynthetic growth of 4 categories of phytoplankton and of seagrass, macroalgae, and coral zooxanthellae, secondary production by zooplankton and corals, air-sea gas exchanges of oxygen and carbon dioxide, and transformations of nitrogen, phosphorus and carbon in various forms. Key ecological processes that were developed specifically for GBR waters include a host-symbiont representation of coral dynamics, a multi-type seagrass model, equilibrium carbon chemistry calculations, Trichodesmium nitrogen fixation, and a spectral-resolved optical model for accurate representation of the in-water light field and water-leaving optical properties (Figure 1). Figure 1. Schematic diagram of the ecological model compartments, links and vertical layers. The new processes for GBR waters have been developed in collaborations with experimental and observational scientists at AIMS, JCU, UQ and UTS and published in the peer-review literature to ensure the robustness of their formulation. A complete description of the optical carbon chemistry and biogeochemical model is given in Appendix B (download at bottom of page). The biogeochemical model is driven by the hydrodynamic model using an offline transport model that is computationally efficient and conserves mass. Initial biogeochemical model conditions and parameters were derived from climatologies, historical observations and literature values, with ocean boundary conditions scaled against density profiles for synchronisation of mesoscale forcing. Coastal nutrient and sediment loads were derived from SOURCE catchment model loads for 21 major river systems along the Queensland coast and atmospheric nutrients were deposited into the upper ocean with rain. Results from a 4 year hindcast were compared with observations from a range of model platforms, sensors and analytical techniques to assess model skill. A completed description of the Biogeochemical model configuration and skill assessment is given in Appendix A and can be downloaded at the bottom of this page). Observational sources include AIMS WQM and Reef Rescue monitoring data, data from Australian Institute of Marine Science and CSIRO cruises, data from the Integrated Marine Observing System (IMOS), glider data and satellite observations. The model reproduced the observed nutrient climatology, the spatial gradients in remotely-sensed ocean colour and in situ water quality observations with sufficient skill for the purpose of a water quality (phytoplankton, nutrients, turbidity, oxygen) hindcast, near real time and scenario simulation in the GBR World Heritage Area. Of the quantities available for comparison with in situ observations, model skill was highest for carbon chemistry properties. Compared to the 14 AIMS Reef Rescue inshore sampling sites, pH had a root mean square (rms) error of +/- 0.03, while aragonite saturation had an rms error of +/- 0.23. Comparison with chlorophyll fluorescence from the Reef Rescue mooring sites with simulated chlorophyll a showed a bias of only -0.07 mg chl a m-3, and a rms error of 0.33 mg chl a m-3. The BGC model is currently routinely running in near real-time and outputs are linked on this website (BGC NRT model outputs). Matlab script for downloading from NCI. R package for downloading eReefs marine model output from NCI and plotting.